Dan Strachan ’85 first got into the Westminster ring 10 years ago. Now he’s showing at the competition for the third time with experience from 300 shows. In a few days, nearly 3,000 top dogs will gather in New York for the Westminster Kennel Club Dog Show to find out who is the best of the best. Among this year’s entries are two dogs owned by UCF alumnus Dan Strachan ’85, a trade-association executive who studied political science at the university. As the second-longest continuously held sporting event in the United States, Westminster is considered a great honor to both compete and win at in the dog show world. Best known for its televised Best in Show exhibition, the competition is open to purebred dogs in the following groups: herding, hound, non-sporting, sporting, terrier, toy and working. 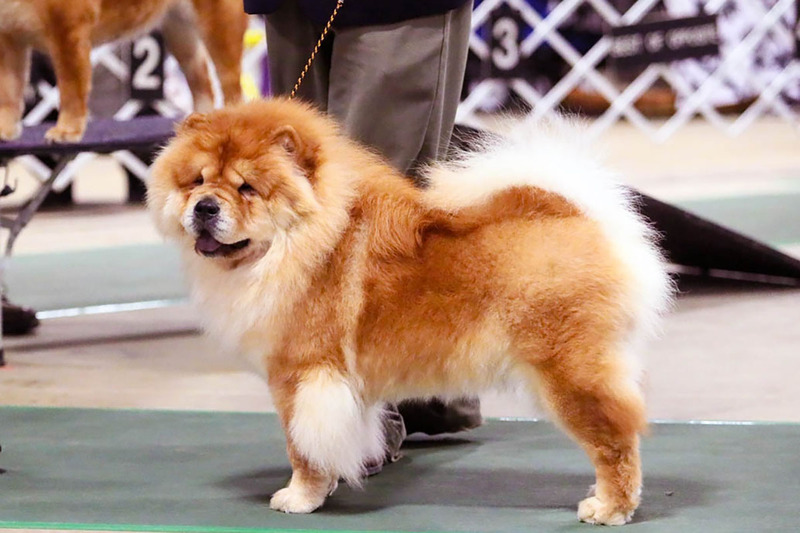 In 1992, Strachan and his partner Tom Masog, who is a transportation engineer, got their first Chow Chow and decided to enter her into a local show just for puppies. After she won, they decided to keep the competitive spirit alive and have continued to show ever since, with about 300 shows now under their belts. This year will be their third time at the Westminster competition. The first was 10 years ago in 2009 and the second last year. How many dog shows have you competed in? Around 300. Of the 10 dogs — all of which have been Chow Chows — we’ve had since 1992, we’ve had seven champions, six canine good citizenship titles and one obedience title. This year we’re showing two dogs. My husband will be showing our grand champion red Chow Chow Gretchen and I’ll be showing her daughter Uma, who I have a special black and gold leash for. Every dog that has been born in our house has been a girl, but the first boy will be named Knightro. Why do you choose to keep working with Chow Chows? My husband and I both work, so our dogs have to be on their own for about 10 to 12 hours a day and that breed can handle being on their own for that long. They’re very loyal, they’re very smart and they’re basically born house-broken. What is the Westminster competition like? The Westminster is not very different from a regular dog show. The difference is the Westminister is considered a benched show, which means the dogs have to stay throughout the whole competition and remain on display for the public to see. (Westminster is one of only six benched dog competitions in the United States.) We have equipment that we use only for that show. Smaller crates, smaller tables because it is a very, very, very tight venue there in New York. The dogs will be bathed and have their initial grooming here at home during the week. We are going to New York on Friday and get settled. On Saturday we will help with other Chow Chow people in the Meet the Breeds exhibition, which will be a part of the events leading up to the dog show. Every breed that is at the dog show has a booth where people can come up and pet them and learn more about the breed. On Sunday the dogs will get a rest while we explore Manhattan and on Monday we’ll head over to the competition area at the Piers 92/94 around 5 a.m. to finish grooming up the dogs. We will show them later that morning and spend the rest of the day with the dogs as people come up to pet them, just like Meet the Breeds. If we were to win Best of Breed that day we would go over to Madison Square Garden that afternoon to prepare for the non-sporting group — that’s what’s televised, the group showings. There isn’t a cash prize, instead there are trophies, medallions and rosette ribbons. Sometimes you come home with nothing. But last year, what we came home with was [that] Martha Stewart, who is a Chow Chow owner, came up to our set-up and had some pictures taken with our dogs. You have to have a very good show dog if you’re going to be in Westminster. They invite the top five of each breed, which there are 160 of, and then there is a lottery for the remaining spots. You have to have a good socialized dog that is a good representation of the breed. And you have to have the stamina to stand on your feet for 10 hours and talk to people over and over again about the same thing. You have to be able to deal with NYC traffic, dogs and crowds. The dogs have to be good with moving in a small area like elevators and crowded hallways. What are some things that go into competing that people don’t think about? A lot of people think it’s like the movie Best in Show, and it’s not exactly. All dogs have their own quirks. The dog I’ll be showing, Uma, likes to have squeaky toys in the ring. Her mother, Gretchen, likes to have treats. So we do whatever it takes to make them show their best. The dogs aren’t competing against each other, they’re competing against a breed standard. There is a breed standard for every breed recognized by the American Kennel Club. The judges are supposed to judge each dog by that standard. That being said it is subjective. But it’s a good time for all. I don’t take it too seriously. A lot of the people showing dogs are called the owner-handlers because they own and show their own dogs. That is true for Tom and I. But there are other people who hire professional handlers whose full-time jobs are to do this, and many times they win, but not always. The thing is if the dog doesn’t like being shown they won’t do well. What are some good starter dogs for people getting into dog shows? And what are some tips? It depends on what works with you. Some breeds are popular like golden retrievers and labs. A lot of people like the smaller breeds, like Yorkshire Terriers, but with those breeds you need to be very, very meticulous in the grooming. Any dog needs to fit your lifestyle and what you want to do and your goals. You should get a dog from a reputable breeder, which you can find through the AKC website. You’ll need to have incredible patience and most of all — have fun. What are some of the more difficult breeds to work with? There are over 160 breeds, but I would say larger breeds like Irish Wolfhounds, Bernese Mountain Dogs, even German Shepherds. You, the handler, have to be in very good physical shape to get around the ring with those dogs. With the Chow Chow, you kind of trot. Golden retrievers are great but they are so popular, it is not uncommon to see 50 or more competing at a show. It’s very difficult to get yours to stand out from the crowd. The poodle is another one because of the grooming. It takes about six hours per show to get the dog ready, then another hour to get it unready and back to its normal coat, and you have to do that every day of the competition. How have dog shows and competitions changed over the years? There is more money involved now. The owners of the top dogs spend thousands on publicity for the dog. They hire professional handlers, who can get thousands of dollars for a Best in Show win at Westminster. The Chow Chow winner from last year was owned by someone who flew over from China solely for the show. I also see more and more families get involved with showing dogs. It’s a good family sport. The AKC has a junior’s competition where kids get in the ring and show the dog. They’re judged on how to show the dog and not the dog itself. This is really good and you see more kids getting into it. The AKC even offers scholarships to junior handlers. What do you like about competing? I like that I am in the ring with my dog. My dog is having fun. Win or lose I make sure my dog has fun. I look at pictures from past competitions and I have great memories. I’ve got a lot of good friends in the breed and in the dog show world. With a busy lifestyle, it’s really good to get your mind off of work. We do it for the fun, we don’t keep track of all the stats because you don’t want to become that person that’s going all over the country in search of wins. These are our dogs. These are our kids. We’re having fun. We’ve had some top Chow Chows in the past and that is very good, but we do it for the fun of it. To watch a live stream of this year’s competition, tune in to Fox Sports GO or the Westminster site from 8 a.m. to 5 p.m. To watch on television, check your local listing.